A lorry driver in southern Brazil had a miraculous escape when his vehicle skidded over the guard rail as he crossed Chavantes bridge linking the states of Sao Paulo and Parana. 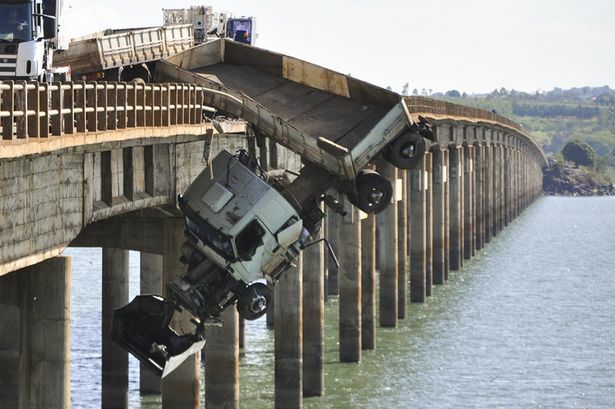 The driver, Aguinaldo da Silva, said he lost control of his unloaded truck after a car stopped abruptly on the bridge. It took nearly half an hour for passers-by to rescue him, using a rope to pull him up from his cabin. Aguinaldo da Silva survived uninjured. Efforts to rescue the lorry on Sunday had to be halted. “The bridge began to shake and there were fears that it would collapse,” said Valcir Machado, from local website npdiario.com, which broke the news. Traffic at the 1,500 m-long (0.9 mile) Chavantes bridge – which goes over a big dam on the border between the two states – has been suspended since the accident on Saturday afternoon.